Most organizations spend much of their effort on the start of the value creation process: namely, creating a strategy, developing new products or services, and analyzing the market. They pay a lot less attention to the end: the crucial “last mile” where consumers come to their website, store, or sales representatives and make a choice. In The Last Mile, Dilip Soman shows how to use insights from behavioral science in order to close that gap. Beginning with an introduction to the last mile problem and the concept of choice architecture, the book takes a deep dive into the psychology of choice, money, and time. It explains how to construct behavioral experiments and understand the data on preferences that they provide. Finally, it provides a range of practical tools with which to overcome common last mile difficulties. 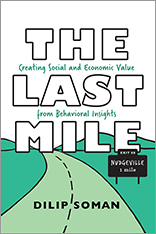 The Last Mile helps lay readers not only to understand behavioral science, but to apply its lessons to their own organizations’ last mile problems, whether they work in business, government, or the nonprofit sector. Appealing to anyone who was fascinated by Dan Ariely’s Predictably Irrational, Richard Thaler and Cass Sunstein’s Nudge, or Daniel Kahneman’s Thinking, Fast and Slow but was not sure how those insights could be practically used, The Last Mile is full of solid, practical advice on how to put the lessons of behavioral science to work.